Is This The Ultimate First Heli? Even if you’re a die-hard car guy, you will probably agree with me when I say that RC helis are cool. Helis are, after all, a whole closer to the RC cars we know than they are to RC plans. How so? Well, take a look at a heli with its canopy off. It’s made with aluminum, graphite, high-tech parts and components–not glue, wood and foam. Plus, helis are high performance. Many RC planes are too, but helis just have more of a high flying attitude if you can pardon the pun. Anyway, to get back to the point, helis may be cool, but they simply aren’t easy to get started in. That is unless you are in the know about coaxial helis that make flying super easy. An experienced car guy will be a real deal heli pilot in about five minutes with a coaxial heli. Coaxials are great, but they just got even better thanks to the release of a $50 model from Horizon Hobby’s Blade line. Bottom Line, the Blade Scout CX is super affordable super easy to fly. Check out the video. I would have to agree with you. I look at helis as the 4x4s of the aircraft world, high-performance go-anywhere machines. I must admit that I never thought to put the two side by side before. 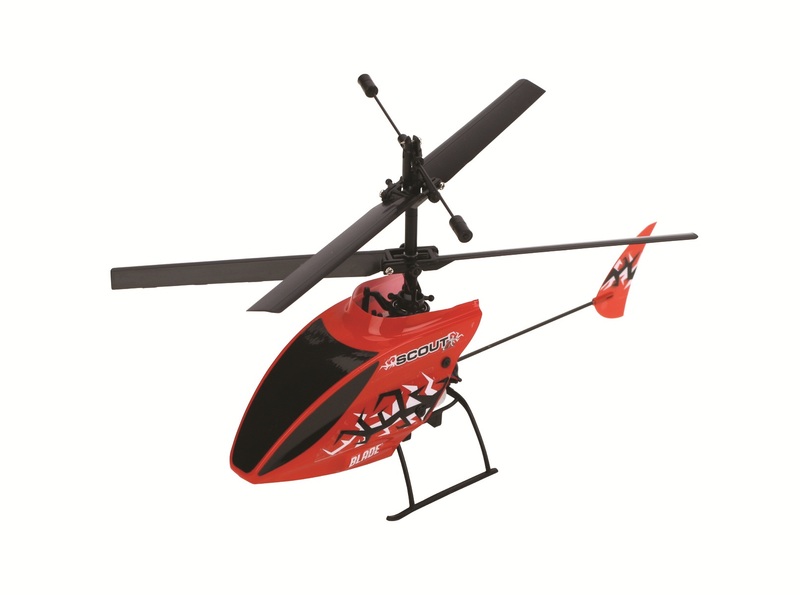 I have to say that I for one am extremely excited to pick up a Blade Scout CX, because I still can’t believe that a quality heli can be sold at such an incredible price. This one is going to attract a lot of new heli fans who may have been turned off in the past with inferior low-price helis. I really can’t wait, and with a price tag like that, I won’t have to wait long. I’ve been learning with an eSky Lama V4, it’s been fun. I did some upgrades and made some changes, and now I’m learning how to set the thing up. I think they’re a lot of fun. I’m torn whether I want to go further and get into the larger scale helis though, because they bigger they get the more expensive the parts/blades are, and you start getting into the need for a large empty field to fly them. It is appealing, though.